Shaheed Udham Singh (December 26, 1899 - July 31, 1940) (Hindi: शहीद ऊधम सिंह, Punjabi:ਸ਼ਹੀਦ ਊਧਮ ਸਿੰਘ) was one of the great patriots of India, with a burning desire to see his motherland free from the clutches of British colonialism and imperialism. He was an Indian independence activist, best known for assassinating Michael O'Dwyer in March 1940 in what has been described as an avenging of the Jallianwalla Bagh Massacre. Udham Singh changed his name to Ram Mohammad Singh Azad, symbolizing the unification of the three major religions of India: Hinduism, Islam and Sikhism. Udham Singh is considered one of the best-known of the more heroic revolutionaries of the Indian freedom struggle; he is also sometimes referred to as Shaheed-i-Azam Sardar Udham Singh (the expression "Shaheed-i-Azam," means "the great martyr"). Bhagat Singh and Udham Singh along with Chandrasekhar Azad, Rajguru and Sukhdev, were the more famous names out of scores of young firebrand freedom fighters in the early part of 20th-century India. These young men believed their motherland would win her freedom only through the jolting up the sleeping British rulers. For their strong belief in display of courage to achieve India's freedom, a nervous England labelled these men as "India's earliest Marxists". Udham Singh was one of the great patriots of India, with a burning desire to see his motherland free from the clutches of British colonialism and imperialism. 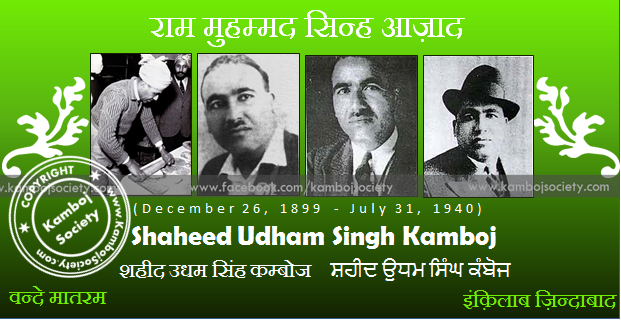 Udham Singh Kamboj was a son of Tehal Singh and born on 26th December, 1899 at Sunam, Sangrur District, Punjab. He belonged to Kamboj family of Jammu gotra (sub-caste) and by his historic martyrdom upheld the valiant Kshatriya tradition of the Kambojas, a tradition which they have always kept up since their glorious Vedic Aryan days. Udham Singh was known at various stages in his relatively short life by the following names: Sher Singh, Udham Singh, Udhan Singh, Ude Singh, Uday Singh, Frank Brazil and Ram Mohammed Singh Azaad. Tehal Singh's name before taking amrit paan was Chuhar Singh. Tehal Singh was at that time working as a watchman on a railway crossing in the neighbouring village of Upall. He died in 1907. As Udham Singh's parents died at very early age of seven, he became orphan and was got admitted along with his elder brother Sadhu Singh in Centre Khalsa Orphanage Pultighar, Amritsar on October 24, 1907 with the help of Bhai Kishan Singh Rogi. As both brothers were administered the Sikh initiatory rites at the Orphanage, they received new names, Sher Singh becoming Udham Singh and Mukta Singh becoming Sadhu Singh. Sadhu Singh did not live long and expired in the year of 1917 which caused a great shock to Udham Singh. He got his educational training in various arts and crafts there and started up a painter shop with the sign board of Ram Muhammad Singh Azaad, which shows that he was a great son of Mother India and believe in secularism above any caste and religion. Udham Singh left the Orphanage after passing the matriculation examination in 1918. 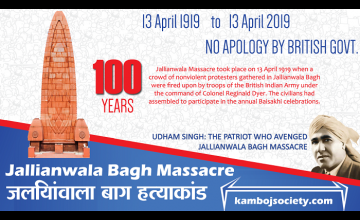 He was present in the Jallianwala Bagh on the fateful Baisakhi day, 13 April 1919, when a peaceful assembly of people was fired upon by General Reginald Edward Harry Dyer, killing over one thousand and three hundred people. The event which Udham Singh used to recall with anger and sorrow, turned him to the path of revolution. 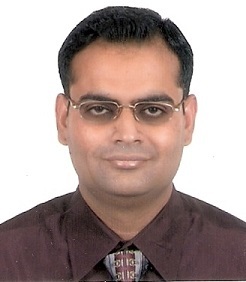 Soon after, he left India and went to the United States of America. He felt thrilled to learn about the militant activities of the Babar Akalis in the early 1920's, and returned home. He had secretly brought with him some revolvers and was arrested by the police in Amritsar, and sentenced to four years imprisonment under the Arms Act in 1928. On release in 1932, he returned to his native Sunam, but harassed by the local police, he once again returned to Amritsar and opened a shop as a signboard painter, assuming the name of Ram Muhammad Singh Azaad. This name, which he was to use later in England, was adopted to emphasize the unity of all the religious communities in India in their struggle for political- freedom. Udham Singh was deeply influenced by the activities of Bhagat Singh and his revolutionary group. In 1935, when he was on a visit to Kashmlr, he was found carrying Bhagat Singh's portrait. He invariably referred to him as his guru. He loved to sing political songs, and was very fond of Ram Prasad Bismal, who was the leading poet of the revolutionaries. After staying for some months in Kashmlr, Udham Singh left India. He wandered about the continent for some time, and reached England by the mid-thirties. He was on the lookout for an opportunity to avenge the Jallianwala Bagh tragedy. The long-waited moment at last came on 13 March 1940. On that day, at 4.30 p.m. in the Caxton Hall, London, where a meeting of the East India Association was being held in conjunction with the Royal Central Asian Society, Udham Singh fired five to six shots from his pistol at Sir Michael O'Dwyer, who was governor of the Punjab when the Amritsar massacre had taken place. O'Dwyer was hit twice and fell to the ground dead and Lord Zetland, the Secretary of State for India, who was presiding over the meeting was injured. Udham Singh was overpowered with a smoking revolver. He in fact made no attempt to escape and continued saying that he had done his duty by his country. On 1 April 1940, Udham Singh was formally charged with the murder of Sir Michael O'Dwyer. On 4 June 1940, he was committed to trial, at the Central Criminal Court, Old Bailey, before Justice Atkinson, who sentenced him to death. An appeal was filed on his behalf which was dismissed on 15 July 1940. On 31 July 1940, Udham Singh was hanged in Pentonville Prison in London. Udham Singh was essentially a man of action and save his statement before the judge at his trial, there was no writing from his pen available to historians. Recently, letters written by him to Shiv Singh Jauhal during his days in prison after the shooting of Sir Michael O'Dwyer have been discovered and published. These letters show him as a man of great courage, with a sense of humour. He called himself a guest of His Majesty King George, and he looked upon death as a bride he was going to wed. By remaining cheerful to the last and going joyfully to the gallows, he followed the example of Bhagat Singh who had been his beau ideal. During the trial, Udham Singh had made a request that his ashes be sent back to his country, but this was not allowed. 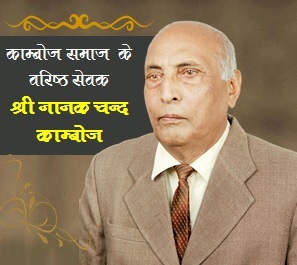 In 1975, however, the Government of India, at the instance of the Punjab Government, finally succeeded in bringing his ashes home. Lakhs of people gathered on the occasion to pay homage to his memory. Shaheed Udham Singh Kamboj served in the Army in Basra for a year and a half and in British East Africa for two years. He returned thereafter to India for a few months and then proceeded to London in the company of one PRITAM SINGH. The two sailed for the United States via Mexico. He worked for two years in California and for some months in Detroit and Chicago, whence he moved to East New York where he lived for five years. Thereafter he shipped for voyages in various vessels of the US Shipping Line according to his own account as a Porto Rican, because no Indians were allowed to be employed on US vessels. (He is known to have held a seaman's certificate in the name of FRANK BRAZIL of Porto Rico). From New York he made a trip to Europe, landing in France, and thereafter visiting Belgium, Germany and going as far as Vilna in Lithuania, returning via Hungary, Poland, Switzerland, Italy and France, embarking there for America. After another few months in the USA, he took employment on vessels plying to most of the Mediterranean ports and thereafter secured employment on the S.S. Jalapa as a carpenter. He arrived in this vessel at Karachi in July, 1927, and deserted from her in Calcutta. While in America he appears to have come under the influence of Ghadr Party [Party of Revolt] and to have been affected by its teaching. He used to read seditious literature published by this party. On 27 July 1927 he was fined at Karachi for having in his possession a large number of obscene postcards. On 30 August 1927 he was arrested at Amritsar as it was suspected that he was in possession of unlicensed Arms. Two revolvers, one pistol, a quantity of ammunition and copies of the prohibited paper, Ghadr-i-Gunj [Voice of Revolt], were recovered from him. He was prosecuted under section 20 of the Arms Act and was sentenced to five years rigorous imprisonment. He stated that he had intended to murder Europeans who were ruling over Indians and that he fully sympathised with the Bolsheviks, as their object was to liberate India from foreign control. He was released from gaol on 23 October 1931. He visited his village for a short time in 1933 and then proceeded to London where in 1934 he was known to be living at 9 Alder Street, Commercial Road. On 5 July 1934, as Udham Singh, he applied in London for endorsements to his passport no. 52753, issued in Lahore: he gave his address as 4, Best Lane, Canterbury, Kent, and said he had a business as a sports outfitter in India, but that he had not worked since his arrival some nine months previously. (There is, however, evidence to show that he had been pursuing the calling of a peddler). He announced that he wished to travel by motor-cycle via Germany, Belgium and Poland to Russia, across Russia to Odessa, where he would take ship for Constantinople en route for India. This was considered rather strange, in view of the fact he had recently broken his arm, but as he had not at that time been identified as an Indian of extremist views no objections could be raised. On 12 May 1936, he applied in London for endorsements for Holland, Germany, Poland, Austria, Hungary and Italy, giving the address 4, Duke Street, Spitalfields, E. The application was granted. On 16 May 1936 he applied in Berlin for further endorsements including the Eastern European countries and the USSR. In view of the fact that he had not asked for these at the time of his application in London four days earlier, he was informed that his case would have to be referred to London, where upon he withdrew his application. On 25 June 1936 he was reported as arriving in London from Leningrad, and in the following November it was reported that he was living with a white woman in the West End of London and was working at intervals on crowd scenes at film studios. On several occasions he is reported to have expressed extreme views and he is known to have boasted that he had smuggled arms into India. In August, 1938, UDHAM SINGH was charged in London with demanding money with menaces. The Jury disagreed at the first trial and he was acquitted at the second trial. He has not come under notice at meetings organised by Indian extremist movements in London. On National Registration day he registered in the name of AZAD Singh, under Serial No. EACK/305/7, giving his occupation as carpenter, and stating that he was born on 23 October 1905. His address was given as: 581 Wimborne Road, Bournemouth. A further record of antecedents was supplied by the prisoner to Detective Sergeant Lisney and this is also attached. It appears his last employment terminated on 7th November, 1939, since when he has been receiving 17/-per week unemployment benefit in the name of SINGH AZAD.